Vermeer's paintings focused on everyday life scenes from neighborhoods in the city of Delft. His subject matter depicts ordinary people and narratives of domesticity in the 17th century. Vermeer was popular for his realistic paintings and thus he can be described as painter of the people for the people. Although Vermeer held nothing original in his artistic interpretation and subject matter, he was extremely skilled in creating superb pieces of art. He didn't create many self portraits, focusing instead on objects that took the viewer to an image as he saw it. Vermeer does not create a specific narrative in his works like his contemporaries did but instead focuses on the moment itself and the rest of the story is created by the viewer. Vermeer was a master in aspects of space and dimension and his ability to effectively use the color palette with all it limitations of the time demonstrates his talent and competency in overcoming obstacles and creating scenes of photographic quality with just a paint brush. To create the astounding effects of light and shadow, it is believed that Vermeer used the camera obscura - a box with a hole with a lens in it. The inside of the box would be painted white and using a series of lenses and mirrors it would reflect the outside image within. This would intensify the light and shadows of the reflection, allowing the artist to see finer detail of light and shadow on surfaces and objects. 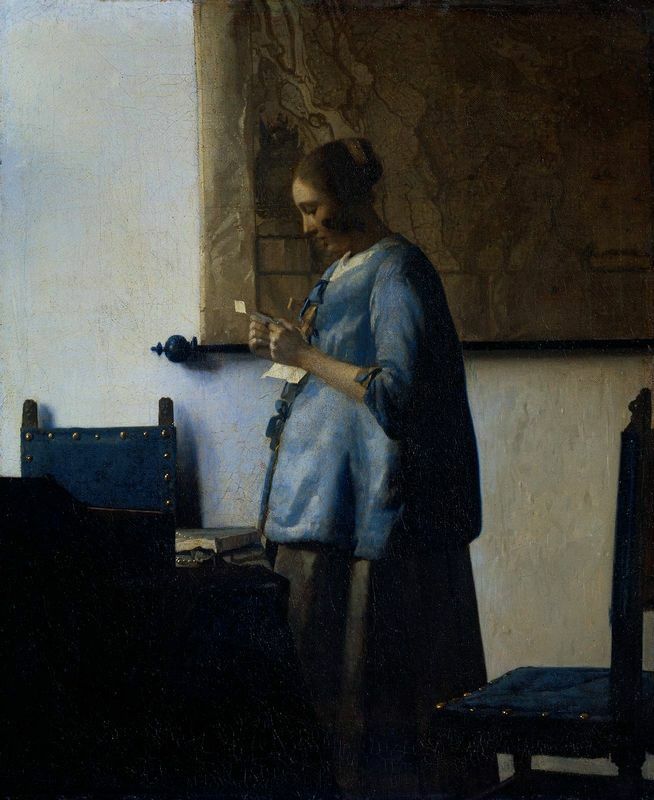 There is a great deal of evidence in Vermeer's works that he used this device, particularly in paintings such as The Lady with the Red Hat and The Lacemaker. 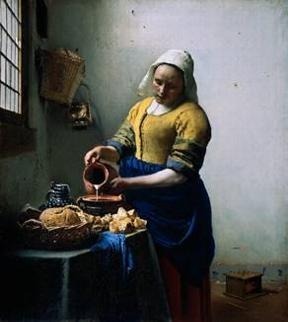 This technique assisted Vermeer in capturing minute details and highlighted aspects of surfaces and objects in dimmed or stark lighting conditions that created spectacular effects through the various lenses and mirrors. This contraption also allowed for shadow lines to be much harsher and bold and this can be seen in the artist's take on clothing and fabrics. Another benefit of using the camera was that Vermeer did not have to constantly move around to catch finer detail for close-ups - he would continue looking inside the box without interrupting his flow of work. Vermeer was not only a master in capturing life objectively; the camera allowed the artist more flexibility in creating moods and atmospheres in the scenes. This would give the spectator an ultimate three-dimensional, realistic and in depth psychological experience of the captured moment. 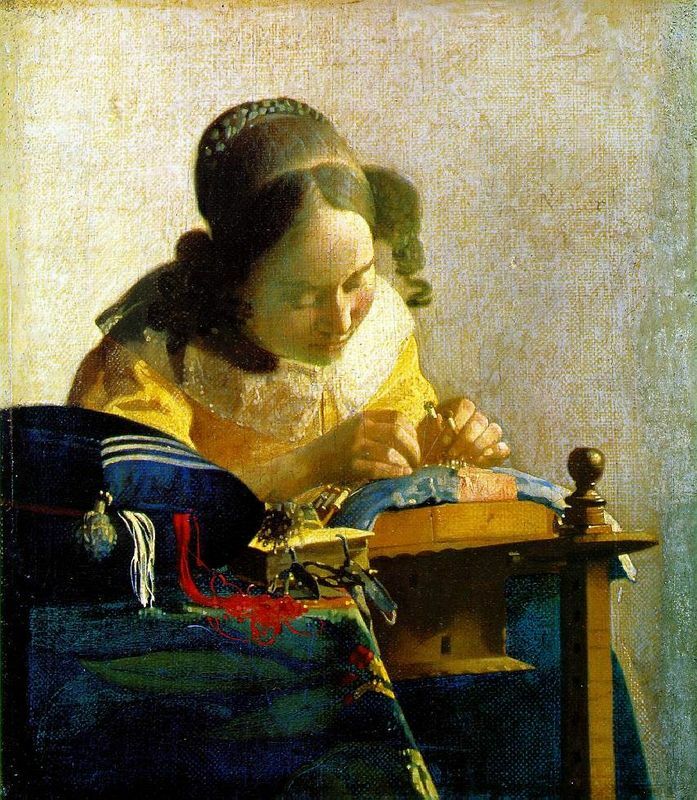 This technique made Vermeer the revolutionary he is today, as he surpassed artists of the time and invented groundbreaking methods in pictorial aesthetics. Paint colors in the 17th Century were generally hard to come by and very limited in range. They were not sold in convenient jars and tubes as they are today but were usually sold at apothecaries in raw powder form which the artist had to prepare themselves. These powders were ground up and mixed with water and were very expensive. 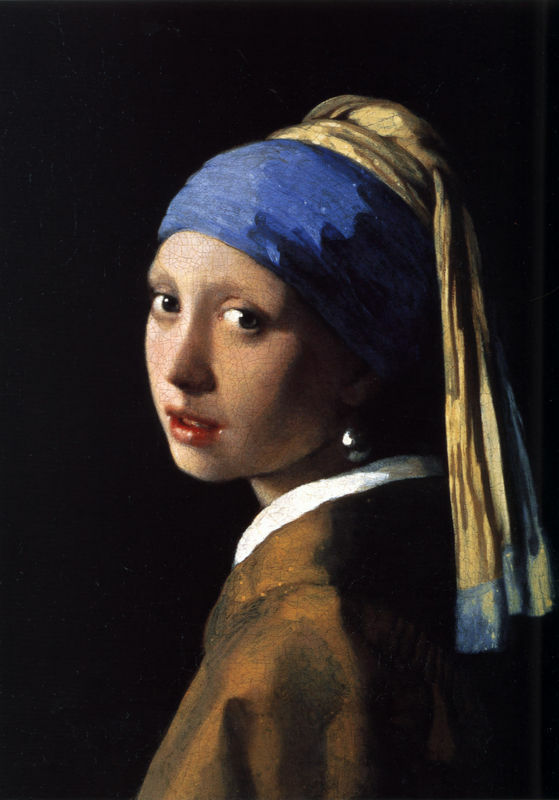 This only accentuated Vermeer's exceptional talent and genius as he overcame such limitations. In general, Vermeer was very excessive with his use of paint and would frequently purchase the expensive ultramarine. Ultramarine was very rare and was made from pigments of the crushed lapis lazuli, a semi-precious gem stone. The artist used ultramarine as an undercoat in his works as he felt this would enhance the painting's visual quality and surface which, he believed, resulted in his techniques being enhanced. This method of under painting in ultramarine can be seen in most of Vermeer's works including Woman Reading a Letter, The Kitchen Maid and Young Woman with a Water Pitcher. Besides using it as an undercoat he enjoyed using the ultramarine elaborately in his pictures to depict clothes and general objects. During the 1670s, Vermeer's painting style significantly matured as he mastered various techniques and his excessive use of the camera obscura and other technical methods were implemented. Over time he incorporated more detail in his paintings to ensure a true sense of realism. 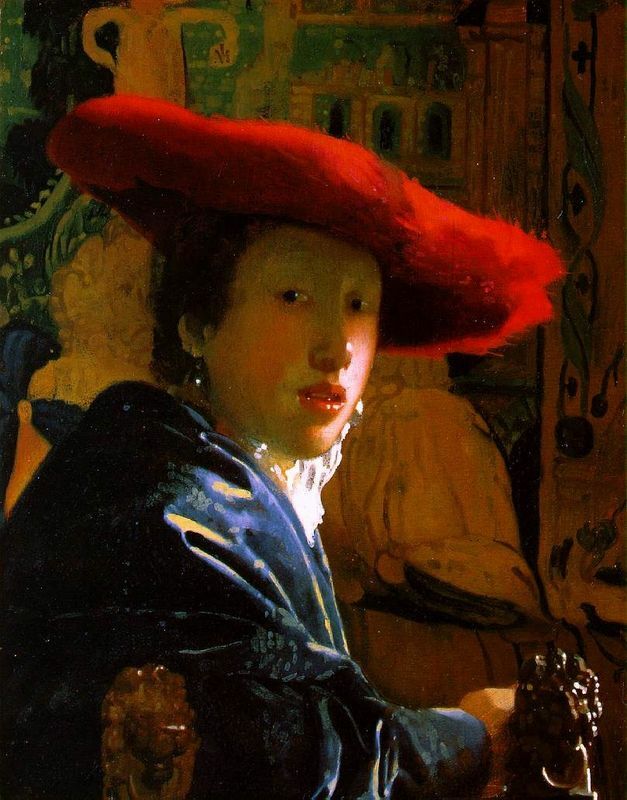 It has been reported by art historians and academics that Vermeer most likely used the tip of his brush handle to erase and recreate certain parts of his image. He can be seen erasing a layer of paint to reveal the undercoating to create a sense of depth and to accentuate several light reflections. To finish off his works, Vermeer's covered them in a type of glaze. This was painted over the paintings to not only protect them but also to add an overall sheen. 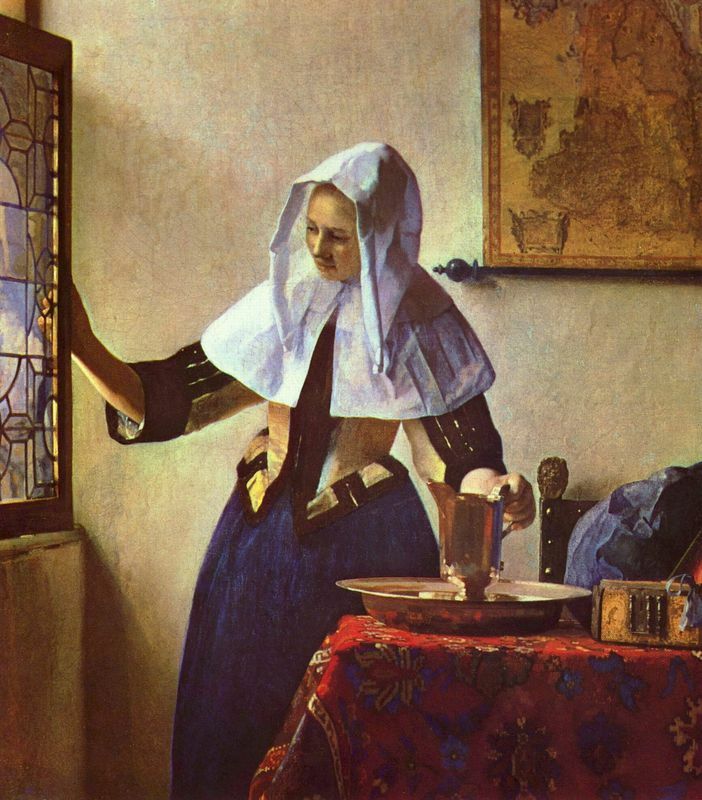 Vermeer's brush work, like most of his painting techniques, is shown to evolve over time as he experiments with different types of daubs and strokes. He sampled different brush strokes to capture different textures. For example, in his portrayal of clothes, tapestries and wood all of them have unique brush work movements and methods to depict them as realistically as possible. Vermeer had figured out all of these methods thanks to his thorough experiments with available tools at the time.